With Echo Auto, drivers can ask Alexa to hear the morning news, listen to an Audible book on your commute, get the latest traffic updates and more. Users also can set a routine that turns on the car’s lights when the driver pulls into the driveway, set reminders to pick up dry cleaning, add errands to a to-do list and check them off when they’re complete, build a shopping list or manage your calendar — all while your eyes stay on the road. In addition to a number of new home Echo devices, Amazon today announced the all-new Echo Auto. The new Echo Auto is available now only by invitation, says the company. At $24.99, Echo Auto is an easy and affordable way to add the power of Alexa to your car or truck, according to Amazon. With an eight-microphone array designed for in-car acoustics and speech recognition technology, Echo Auto lets Alexa hear you over music, A/C and road noise. 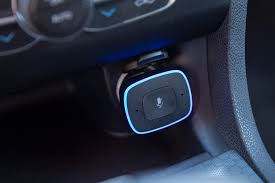 The device is powered by your car’s 12V power outlet or USB port, and connects to your stereo system through a 3.5 mm audio jack or Bluetooth connection. It connects to Alexa through the Alexa app on your smartphone and uses your existing phone plan to access a range of features such as music, navigation, calling and more.